Navigating Early is such a warm and touching story, it’s impossible for it not to stay with you for a long time after you’ve read it. It’s mainly about friendship, but it’s also about love, family, loss, and acceptance. Set in post-World War II United States, it illustrates how in life, there are no coincidences – “just miracles by the boatloads.” Navigating Early is the first book I’ve read for the new year, and nothing could be more perfect to start off the reading year than a wonderful book such as this. Jack Baker is a lost boy: his mother has just died, and his father, a naval officer who came home from his tour of duty to bury her and put the family's affairs to order, has decided to uproot his only son from their flat little world in Kansas and put him in an exclusive boarding school in coastal Maine. To say that Jack is a displaced, floundering boy would be an understatement. He’s the newcomer in school, his father is a thousand miles away, and only the fading memory of his mother gave him strength to go on. And then he meets Early Auden, that strangest of boys who keeps to himself all the time, who reads numbers like a story and insists that the number pi never ends, and who listens only to Billie Holiday when it rains. They inadvertently form a bond that takes them on a journey on the Great Appalachian Trail to find Pi, who went missing, and the Great Bear. In the process, they find and discover many other things that will teach them the greatest lessons in their lives – they find themselves, among others. I related very well to what Jack was going through, with the loss of his mother at an early age. Losing a parent is one of the most heartbreaking things a teenager could possibly go through. His father, a soldier, was a stranger to him; he was distant and seemingly unfeeling towards his only son. So I sympathized with Jack and his plight, his displacement, and how he attempted to cope. On the other hand, Early was a gifted boy who befriends and helps Jack out. Early doesn’t care much that he doesn’t fit in with the other kids; he has his own workshop in a basement and was happy spending time alone in it. Reading about Early, I was completely endeared by him; he is smart, organized, and confident about things that he has spent time poring over and studying. He is charming in his own special way, although he could get stubborn when he knows that he is right. While the book doesn’t directly address Early’s condition, one can easily deduce from his special “gifts” that Early falls within what is presently called the autism spectrum disorder (ASD). This makes Early quite the character, I believe. When Jack wanders into his workshop one day, they get to talking about the number pi, prompting Early to tell Jack the story of Pi, the number “1” in the first digits of π, “3.14”. Early claims that Pi, somewhere along his journey, got lost. Early wants to go on a quest to find him, and it is in this quest that the story of Pi, on the one hand, unfolds with Early’s and Jack’s, who are living theirs, on the other. 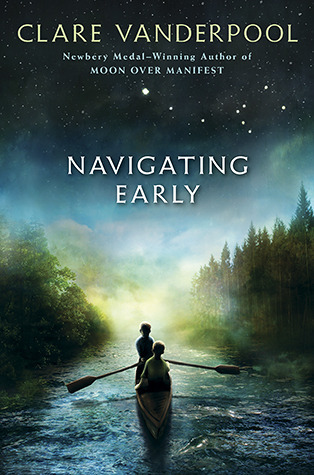 Navigating Early is a beautiful story that appeals to both children and adults, as the lessons it imparts can be shared and learned regardless of age. Early and Jack each had their own ghosts to face and difficulties to endure, and despite the differences in their circumstances, they endeavored their best to pull through. Their story, while sometimes veering towards the impractical or nearly improbable, was inspiring. The parallel story of Pi, too, while existing only in Early’s head, showed that persistence and determination pay off in the end. Clare Vanderpool writes fluidly and straightforwardly, and I was drawn towards the two boys at the outset. I loved how she managed to entwine the real story with the imagined one but still separately tell them: Early and Jack, Pi. I loved how the pieces of the puzzle were slowly revealed and came together, completely taking me off-guard but in a pleasant way. I loved how she resolved their stories, these boys, that left little tears in my eyes as I read them. Our book club is reading and discussing Navigating Early this month. I am looking forward to this discussion. Join us? Finding your way doesn’t mean you always know where you’re going. It’s knowing how to find your way back home that’s important.